Please get WebSMS 3 from market. This will be the last update to WebSMS-2.x. 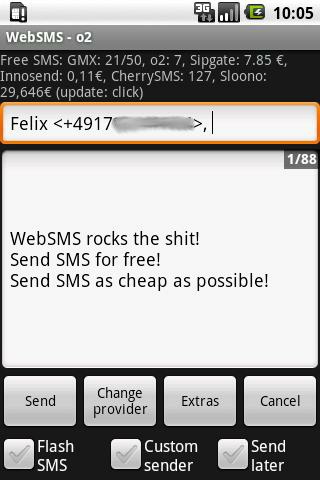 WebSMS sends free to cheap SMS via GMX, o2, sipgate.de, sipgate.at, innosend.de, cherry-sms.com, sloono.de or arcor.de. Lightweight GPS-Measuring, no graphics, just numbers. Saves positions in a file for further use e.g.